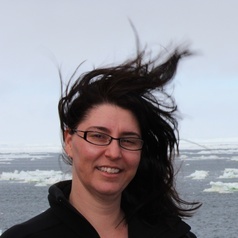 Dr Donna Roberts is a senior research fellow with the ocean acidification team at the Antarctic Climate & Ecosystems Cooperative Research Centre. For over a decade, Donna has focused on the microscopic world in and around Antarctica – the plants and animals at the very bottom of the food chain that underpin entire ecosystems. Recently, Donna’s research has been at the forefront of discovering just how vulnerable the Southern Ocean ecosystem is to acidification and how strongly even small changes in ocean pH will affect marine life, particularly those most at risk, shelled sea snails or pteropods, more poetically known as ‘sea butterflies’. Donna’s keen eye for the little things is helping focus the world’s attention on some of the biggest issues facing the planet, particularly the increasingly worrying picture of ocean health in a changing climate.